St. John's members portray the disciples in this undated vintage photo, the first record of a photograph from The Last Supper Drama. Actors, from left to right, are Luverne Hafemeyer, Earl Meese, Victor Luedke, Howard Meese, Virgil Bosshart, Arnold Keller, P.L. Golden, Alvin Bosshart, Paul Bauer, Elmer Covert Sr. and Arnold Bauer. Photo courtesy of St. John's United Church of Christ, Wheeling Township. EVERY LENTEN SEASON since 1963, worshipers and actors have gathered inside the 1870 limestone sanctuary of St. John’s United Church of Christ—Wheeling Township, rural Faribault, for The Last Supper Drama. Sunday, April 1, marks the 50th anniversary presentation of the drama penned by long-ago St. John’s pastor the Rev. Walter C. Rasche. He wrote the script while serving in an Indiana parish and brought it with him to Minnesota. 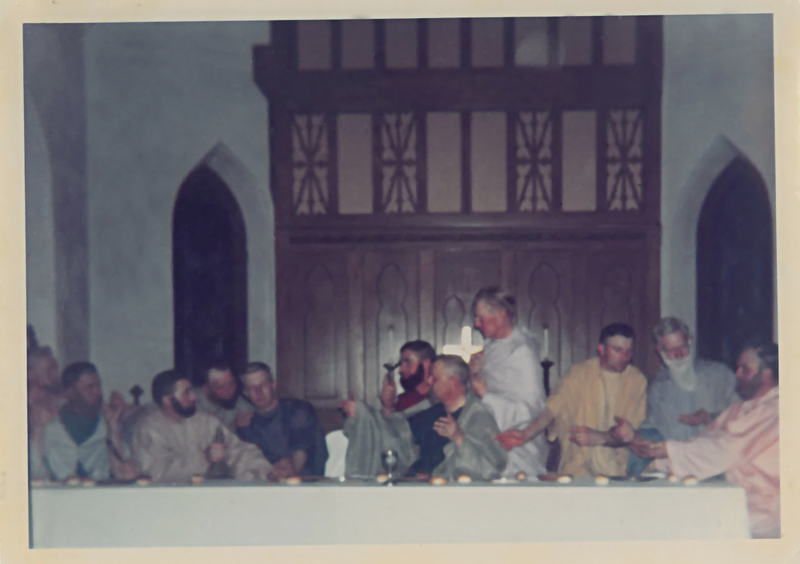 When Rasche left St. John’s in 1969, The Last Supper Drama tradition continued. The script, which features 12 men positioned like the disciples in Leonardo da Vinci’s The Last Supper painting and then speaking individually about their relationships with Christ, has remained unchanged in five decades. 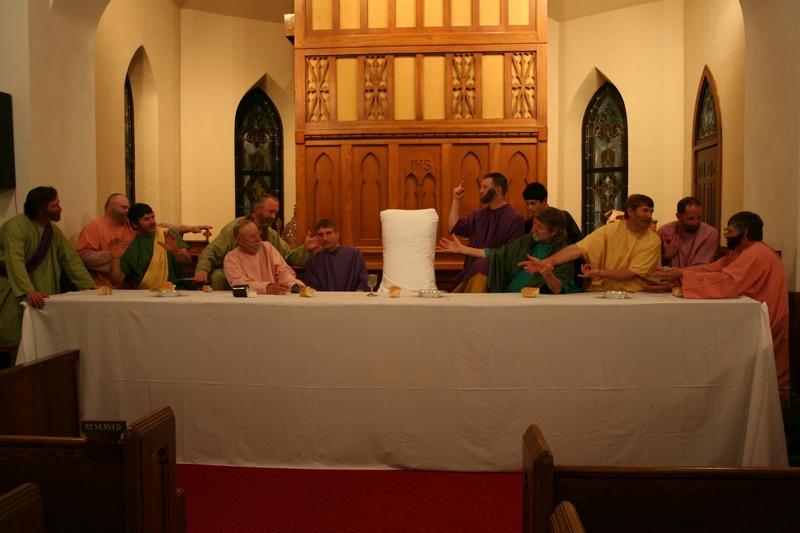 Cast members in the 2011 The Last Supper Drama, left to right: Todd Lein, Craig Mueller, Alan Meyer, Grant Meese, Martin Budde, Paul Meyer, Thad Monroe, Kyle Keller, Doug Spike, Keith Keller, Randy Tatge and Brian Little. The white pillow on the empty chair represents Christ. Likewise, the same hymn, “Here, Oh My Lord, I See Thee Face to Face,” continues as the single participatory musical selection. Craig Keller, drama organist, plays the same taped mood-setting organ music he’s used since 1968. Prior to that, introductory music emitted from a record player stationed behind the altar. For original cast member and life-long St. John’s member Luverne Hafemeyer, 84 of Northfield, the drama is, he says, an emotional and inspirational experience that prepares him for Easter. As a young farmer, Luverne jumped at the opportunity to join the original 1963 cast. During his high school years, except for an annual Youth Fellowship play presented in the nearby Nerstrand Town Hall, he had never acted. Farm work and gas rationing during WW II kept him from participating in high school activities. But once Luverne joined The Last Supper Drama cast, he stayed on for 15 – 20 performances, finally relinquishing his role as James just five years ago. (Casts alternate from year to year.) He still helps sometimes with lighting and the post performance coffee hour. Like Luverne 50 years ago, all of today’s actors at this rural church come from a farm background. Co-director Pauline remembers her father, Arnold Keller, and her brother Keith practicing their lines while milking cows. Actors, past and present, will be recognized during the 50th anniversary presentation set for 8 p.m. this Sunday inside the old stone church. FYI: St. John’s United Church of Christ is located eight miles east of Faribault on Minnesota Highway 60 and then two miles north on Rice County Road 24 at 19086 Jacobs Avenue. Visit the church website by clicking here. To read a blog I posted about last year’s The Last Supper Drama, click here. You’ll find many more images of the drama posted here. I am tempted to show up for this…. This sounds like an amazing drama, one that I’ve never personally seen acted out. A bonus for me would also be the old church, I love old churchs (and barns and farmers…etc etc.). Thanks for sharing this Audrey. I assure you that this would be worth your trip from Rochester. I’m not sure yet if I’m attending. But if you see me there, be sure to say “hi.” I’ll have my camera with me, although photos are not allowed during the performance. There are plenty of photo ops afterward. If you are unsure if you are attending or not….maybe this will help…. When I was home a couple of weeks ago, I attended the wedding reception of my cousin. We ran into my uncle who has been a member of St. John’s all of his life and has been part of these dramas for many years. He was looking terribly “scruffy.” He said that all of the men were attempting to grow out their beards and hair this year in celebration of the 50th anniversary. As far as I know, most of them were able to do it, I know one or two don’t have the privilege of beard growing. But knowing that there will be less costuming, may be incentive. I am sad to say that even though my mom grew up in this church, and my grandma still attends, I have never been to one of these dramas. I wish I was closer now to be able to attend because I feel like it would be fantastic! Thanks for the extra incentive, Amy. I am surprised to hear that you have never attended. I think this drama should be required attendance for every confirmation class in the area. I’m impressed, too, with that 50-year run and hope the sanctuary is packed. It hasn’t been the two times I’ve attended. When the drama first started, the church presented more than one performance each year to accommodate everyone.